WE NEED YOU! HOW YOU CAN HELP! 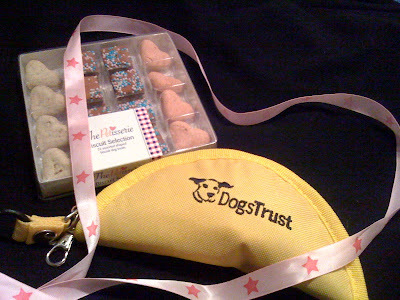 Doggie Treat Pack - Romance Pack for that special 'somepup' in your life - AUCTION ITEM - bidding to start at $5.00 - unfortunately can NOT ship to Australia (as the customs people there confiscate doggie noms to eat themselves! ), but will ship everywhere else!! To e-mail the pup providing this auction item please click here! Let that special somepup know JUST how special they are with this cute 'wine 'em and dine 'em' romance pack! Contains a delectable pack of prettily presented doggie candy (the 'dine' part!) 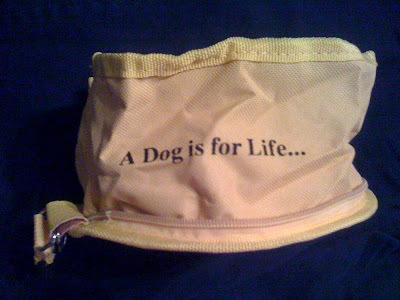 plus a jaunty yellow portable drinking bowl (the 'wine' part! ), all done up with a pretty bow! The drinking bowl unzips to a convenient drinking receptacle that is large enough to cater for even the plus size doggies. Go on - let your heart rule your head and place an order for this item today! Please leave any questions you might have about this item in the 'comments' section below for the auction item owner to respond to! ONLY 4 AVAILABLE - BID NOW (STARTING PRICE $5.00) BY LEAVING YOUR NAME AND BID PRICE IN THE 'POST A COMMENT' SECTION BELOW - AND FEEL FREE TO CONTINUE TO BID SO THAT YOU OUTBID YOUR FELLOW CONTESTANTS!! WE WILL CONTACT THE HIGHEST BIDDER WHEN THE AUCTION CLOSES. Thank you for helping sweet Shelby! Donate direct to help Shelby!